Night in the central Serengeti early one February morning. The light in this scene is all natural light from the night sky. Photographing at night on the Serengeti is very dangerous. Predators, in particular big cats hunt at night. My group has had leopard encounters at night on this and on previous trips. For safety, we hired local staff to stand guard and watch our backs while we made our images. It is still difficult as we want no lights on during the imaging session. The yellow and red light in the night sky is from airglow, light from molecules in Earth's upper atmosphere excited by solar ultraviolet light during the day and from cosmic rays. The molecules emit light throughout the night. The red is typically from hydroxyl (OH) 80 to 90 km high, and the green is from oxygen around 95 km high, and the two combined give yellow. The morning was slightly hazy creating the diffuse glow around the brighter stars, which also enhances their color. For more on natural color in the night sky see Parts 2a, 2b, 2c and 2d on Color of the Night Sky and proper post processing to show those colors. 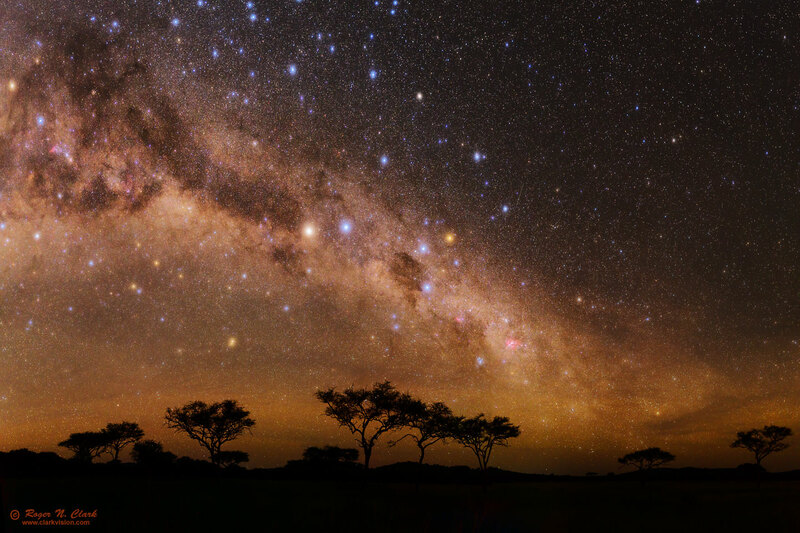 The image shows the southern Milky Way. Scorpio is at the left edge and Centaurus is centered, with the Southern Cross above the 3 trees at lower center. Technical. This image is a 21-frame mosaic. Canon 6D 20-megapixel digital camera, Sigma 35 mm f/1.4 DG HSM lens at f/1.4. twenty-one exposures at ISO 1600 were made, each a 30 second exposure. Exposure of the stars were tracked using an iOptron SkyTracker. Full resolution image is 10,085 x 6,723 pixels (68 megapixels). Higher resolution crop, equivalent to the view about what would be seen in a 47 x 70 inch print. The camera tracked the sky, which kept the stars round in the 30-second exposures. The land and trees remain sharp because the slight blur is not noticeable to the same degree star trailing would be visible if the camera were static.